Average leaf size is about 2" long and a little less in width. Very fine (but not really sharp) teeth along the edges. Undersides lighter green but no hair apparent on the leaves or stems. Leaves are arranged opposite along the stems, and there are what appear to be spur-type stems with leaves clustered tightly at the ends...and very close growth rings on the bare parts of these "spurs". For size reference, the trunk diameter just above the base/roots is about 3". Anyone have any thoughts on what species this is? I can provide other photos or additional descriptive info if requested. Thanks! I'd like to see a picture of the whole tree if that's possible. At fist blush that bark reminds me of pyrus calleryana (Callery pear). but that's just a guess. It has spurs, and often comes up from seed dropped by birds. It doesn't look like apple at all. or maybe a pear (Pyrus)?? Yeah, I neglected to take a photo of the entire tree...will get one posted later today. Once I started looking on-line at apple leaves, then pear leaves, then plum...I realized that the differences appear to be very slight. Might be very difficult to positively ID unless it decides to bloom. Prunus mahaleb seems to be a European tree, not sure I should expect them to be growing in farm hedgerows here in western NY? Hmm, after reviewing some info on-line, it does look a lot like prunus mahaleb, which apparently does grow wild in this area as an introduced species. I'll examine the tree further later and post some other photos...thanks for the suggestion! 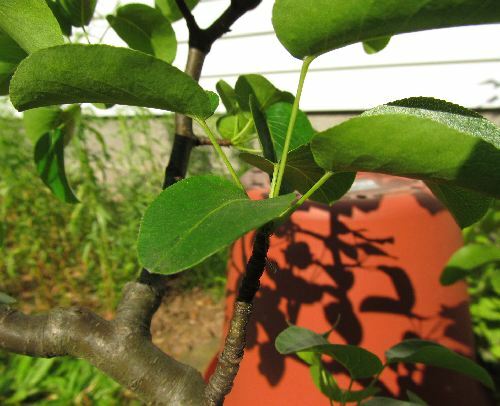 I grow pears -- in pots and in the yard -- so I'm pretty sure it isn't one of them. 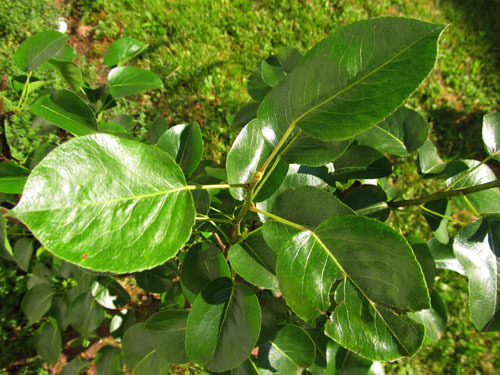 Prunus mahaleb leaves seem to be shinier on the upper surface than yours. I think the previous owner is right. Looks like a callery pear type seedling to me. Russell Coker wrote: Looks like a callery pear type seedling to me. Definately!!!!!! No question about it!!!!!!! Yep, isn't that what we said all along??? Russell Coker wrote: Yep, isn't that what we said all along??? Well, I think you guys win the prize. 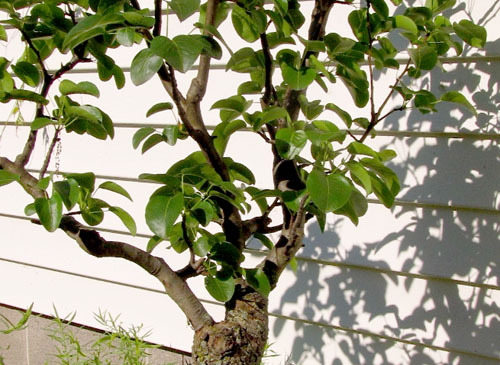 You can come pick up your new pear tree anytime You'll have to figure out how to split it, though (Randy and Russell). It does look an awful lot like callery (bradford) pear. I hate those trees in the landscape, so over-used...so I don't know how I feel about potentially having one as a bonsai. Considering it's been in a relatively small container for a while now, the leaves are quite large and the growth is coarse. Not sure if it can be tamed (and it doesn't look like the previous owner made much attempt). Then again, I'm a beginner so I don't know what I can't do (yet) so I'll probably give it a shot. Russell can have it, I already have 2. 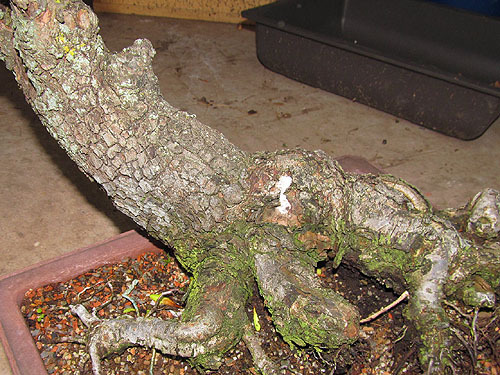 I've seen some nice bonsai made out of it so you should keep it. 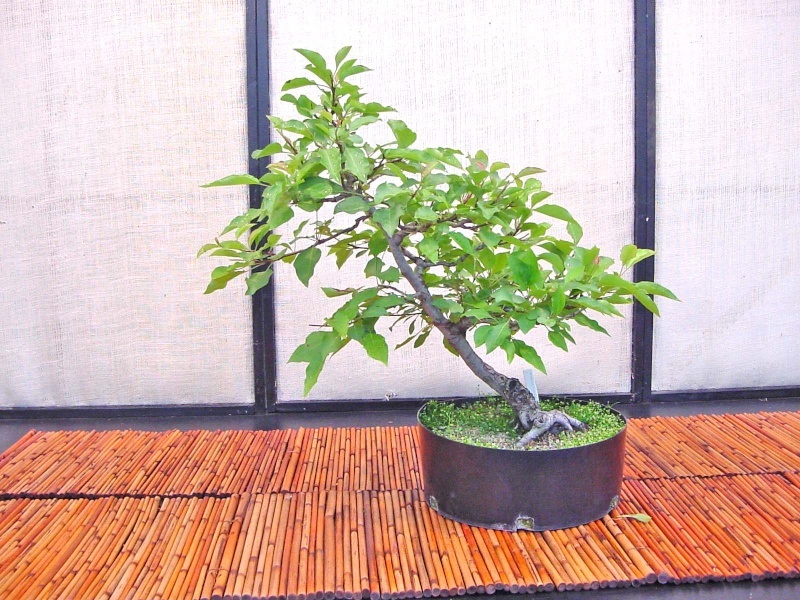 My suggestion is make a larger bonsai 18-24" and leaf size won't be a problem. Whack the CRA* out of it and it will bud back quite nicely. I also don't like it as a landscape tree but it does put on a good fall show of color. Thanks for the tip. It will probably actually feel quite good to hack away at a callery pear! Have you ever posted images of your two? I'd be curious to see what you've done with them. I didn't see many examples when I searched the internet, but it does look like there is a bradford pear in the National collection in Washington DC. That's a good sign! I'll take it! Seriously, I think the seedlings of 'Bradford', 'Aristocrat' and the others revert to the typical callery pear, so that's a plus. They also have great bark, beautiful fall color, flowers in the spring and then fruit. Hell, I wish I could find a nice one like yours to mess around with. Good luck! 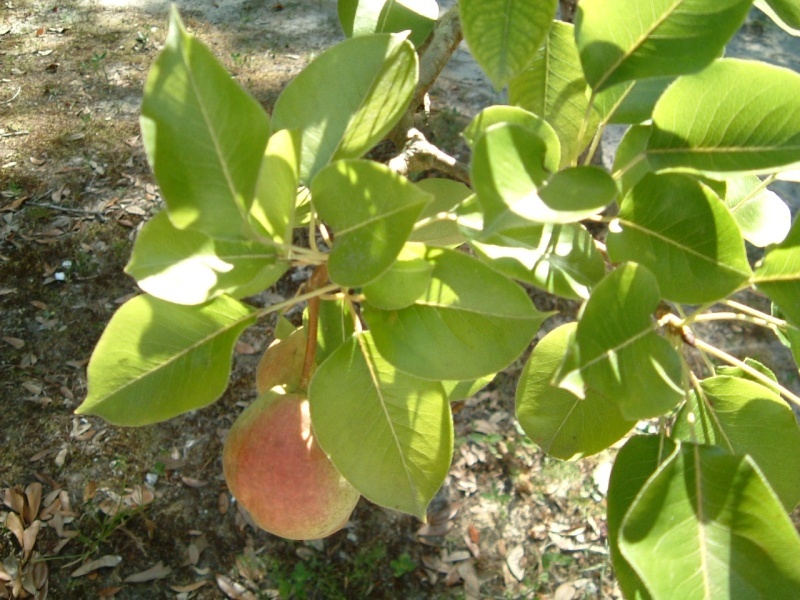 JimLewis wrote: I grow pears -- in pots and in the yard -- so I'm pretty sure it isn't one of them. Really?? Because I was pretty sure it IS one of them - from the very first picture. Here is a shot of a pitiful, drought-stricken pear in a neighbor's yard with a couple of sad fruit. Looks pretty much the same to me. Same spur type growth, same slick, shiny leaves, same rough bark. How is it different from the pears you grow in pots and in your yard?? I don't know if Jim is going to respond, but for now I'm working under the assumption that it's a pear. When I get some free time I'm going to visit a local apple orchard (they're all over the place up here) and also visit a bradford pear orchard (basically any shopping center parking lot or new subdivision) and do some comparisons. Randy, I don't know if you saw my earlier comment, but I'd like to see what you've done with your 2 pear trees. I've searched the archives but haven't been able to find them, so maybe you've never posted pics? 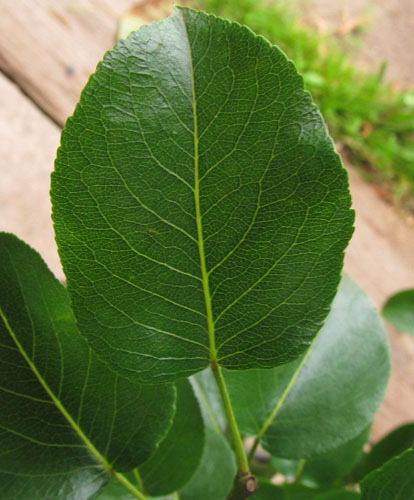 Without seeing the leaf( which by the way is a Pear),the distinctive cubed bark is definitely a Pear. coh wrote: Randy, I don't know if you saw my earlier comment, but I'd like to see what you've done with your 2 pear trees. I've searched the archives but haven't been able to find them, so maybe you've never posted pics? I have 2 P. calleryana that I'm working on and neither of them is in a finished state. I only have the picture below of one of them and it's in dire need of the left side filling out. I'm planning on putting it into a larger shallow pot next year just so I can get those smaller lower branches to thicken up a bit. My camera died yesterday so I can't take a picture of a better one that I'm working on but someday soon I might be able to afford a new camera. I feel so naked without a camera to document my work. Thanks Randy, it looks to be developing well. Got a nice overall shape. How tall? coh wrote: Thanks Randy, it looks to be developing well. Got a nice overall shape. How tall? Never measured it but it's something like 16-18" from the soil line to the top of the tree.